NEW BMW M8 GRAN COUPÉ. COMING TO BARRETTS BMW IN ASHFORD AND CANTERBURY. The luxury of the new BMW 8 Series seamlessly combines with the power of BMW M, creating the all-new BMW M8 Gran Coupé Concept. Oozing elegance and top performance, this sporty Coupé is a flamboyant, unforgettable experience. 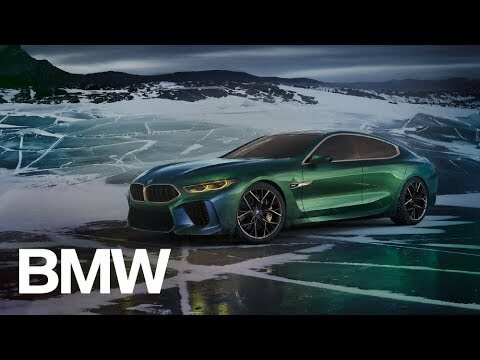 THE BMW M8 GRAN COUPÉ IN MORE DETAIL. A contemporary twist. The sharp, defined silhouette will dominate the road. Fusing the traditional BMW 8 Series design with BMW M8 GTE endurance Grand Tourer inspired light technology a hexagonal interpretation of the classic four eye visage is created. The new BMW M8 Gran Coupé delivers a sense of movement - majestic from all angles. With the exclusive graduated paint finish in 'Salève Vert, the body captures colours reminiscent of the polar lights by changing from an elegant green to a greyish blue.